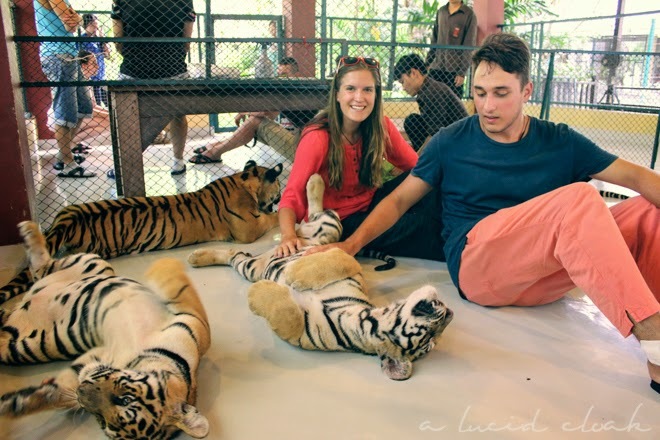 I'm not going to lie, one of the main reasons I was so adamant about going to Chiang Mai was because I really, really, really, wanted to see the tigers. 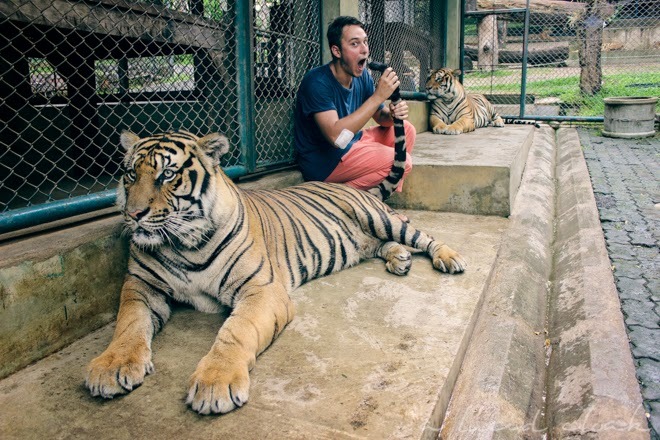 Chiang Mai is one of the few places in the world where you can frolic, play, pet, and get your photos taken with real live tigers. Yup. Real tigers. 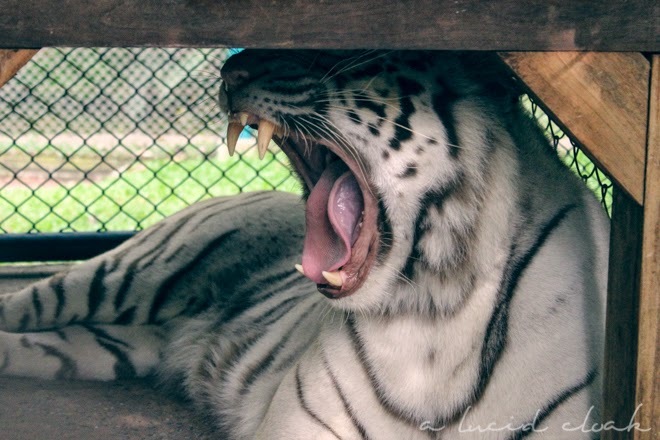 As terrifying as it sounds, visiting Tiger Kingdom was probably the top experience I had during my six weeks in South East Asia. 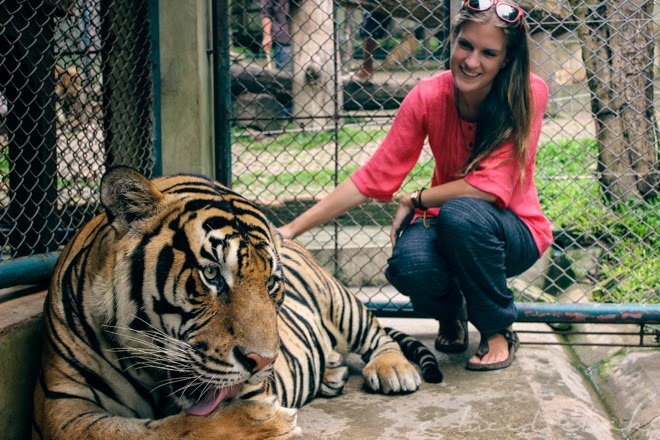 There's a lot of controversy surrounding whether or not the tigers here are drugged in order to be calm and placated for the tourists. I don't have any surefire evidence of whether or not they are, but the tigers we saw were alert, active, and playful. 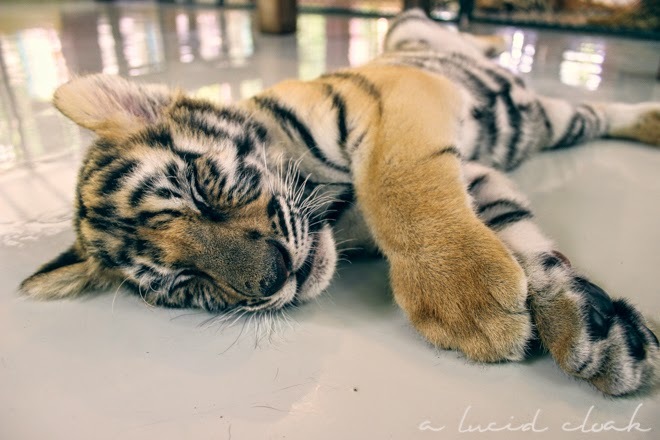 The trainers specifically tell you not to play with the baby tigers so that they grow up realizing humans are not playmates. 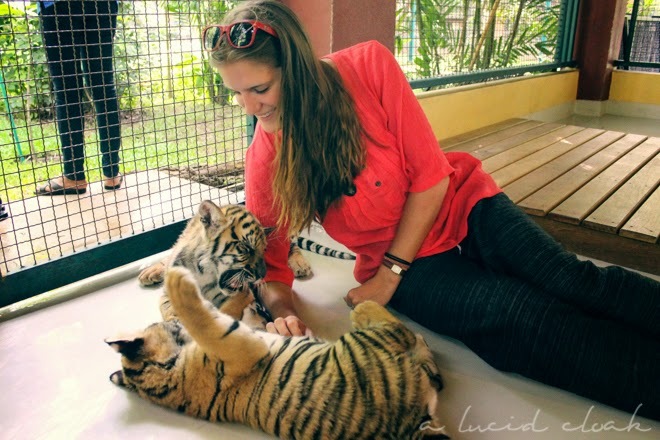 Could you imagine a grown tiger play fighting with a human?! It would be quite an uneven match. There was a trainer constantly with us and specific rules we had to follow with the tigers, such as never approaching them from straight on and never petting their heads. Looking back at these photos, they still seem as surreal as actually being there in person. On our second day in Chiang Mai we decided to walk around the city and check out some temples. The first one we stopped at was Wat Chedi Luang, which gleamed with millions of jewels and a huge golden Buddha seated inside. The highlight of this temple was their "Speak to a Monk" program. Monks make themselves available to tourists and guests for answering any questions you may have about Buddhism or their lifestyle. You gain knowledge, and the monks get to practice their English. 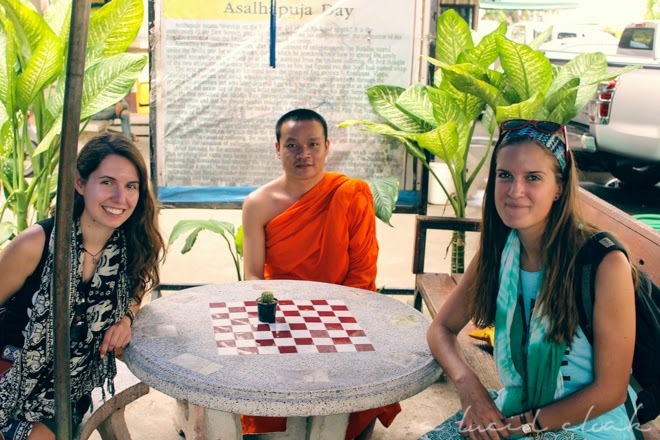 The monk was very eager and happy to answer all the questions we threw at him. We learned many important beliefs and central tenets of Buddhism. Forgiving is good, but forgetting is better. Live in the moment and don't think about the past or the future; otherwise you will miss the here and now. Positive thoughts equal a positive life. And the lesson that stuck with me the most: never worry, because worrying can't change a single thing. Conversing with the monk was an enlightening and calming experience. It was incredible to just sit in his presence and soak up the calm and relaxed state that he was in. Feeling that we couldn't possibly benefit any further from more temples after such an experience, we spent the rest of the day wandering the streets and visiting the shops and cafes of Chiang Mai. There was a wonderful paper-making store, a t-shirt store where every shirt was a mere $3, and a delicious outdoor smoothie bar where we stopped for refreshments.